There are many kinds of love in our world... from the 'sisterly love' to the 'love of you children' to the 'passionate love' to a 'love chocolate' to the 'romantic love'. Celebrate the romantic type of love with this sweet and easy card. This unique card opens and has even more love.. so go ahead, give this for a wedding or an anniversary... or just because you are feeling romantic! 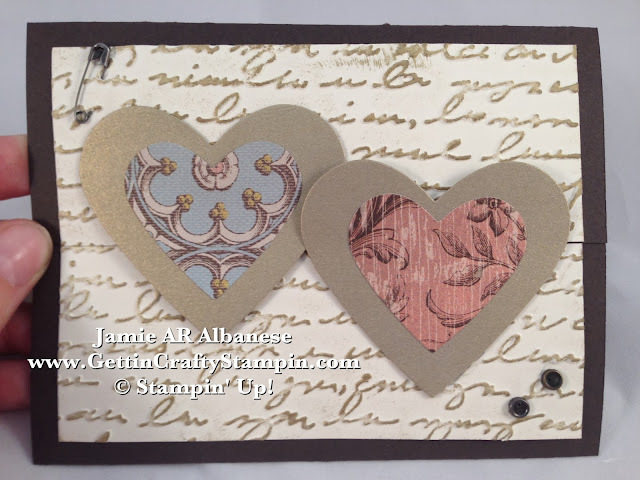 Using my Stampin' Trimmer I cut this card at 5-1/2" Score at 2-1/8" on each side. This will create a tri fold card. Emboss this Very Vanilla card stock with the Pretty Print Textured Impressions Embossing Folder and Big Shot Die-Cutting Machine. 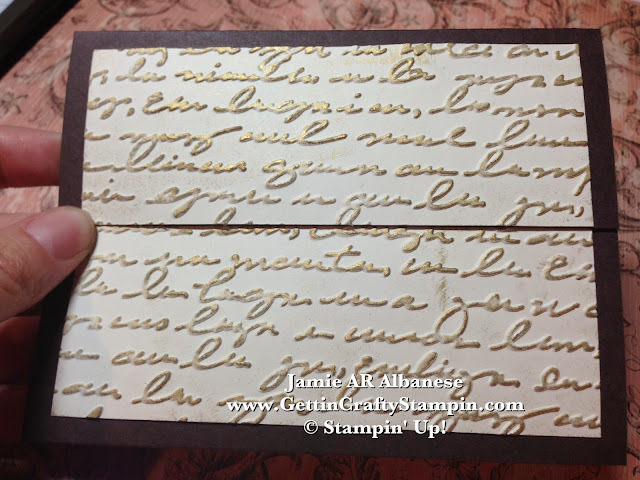 'Guild' the top of this raised 'romantic' type print with the Gold Encore Metallic Pad rubbed gently across the top of the raised embossing. 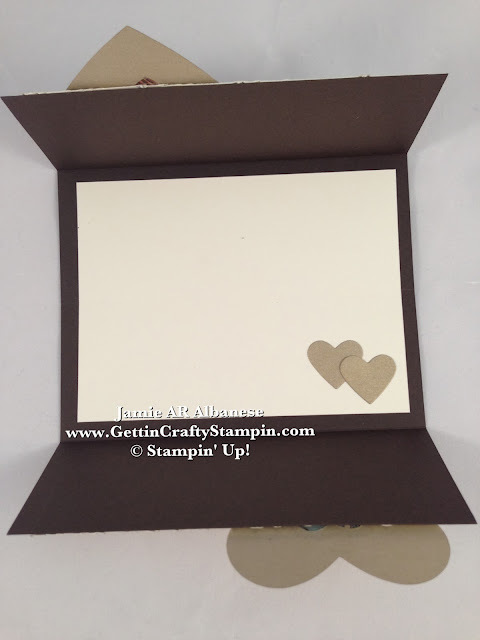 Cut in 1/2 and using my SNAIL Adhesive adhere so it meets back up in the middle of this card. Adding a dash of Vintage fun these metal Vintage Trinkets. 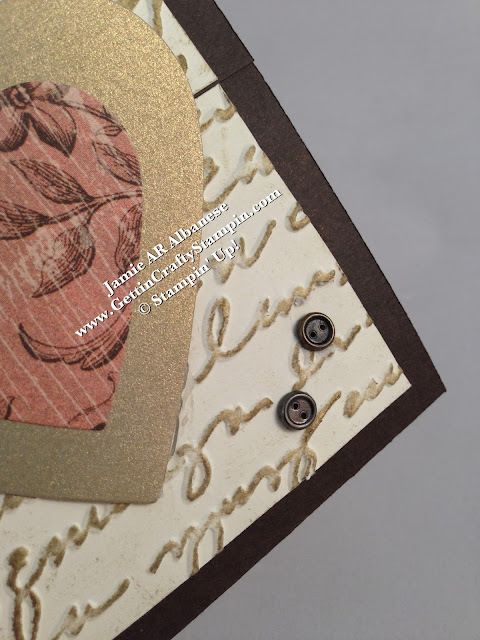 The fun buttons are actually brads and though this card is romantic and a dash feminine, lol, this metal accent is a little nod to the men in our lives - lol. Pierce this card... well, let the vintage 'safety pin' do this to the card! I love the graphic and edgy feel it adds to the card. These Vintage Trinkets come in Antique Brass, Antique Gold and Pewter. Though small they add a big impact! 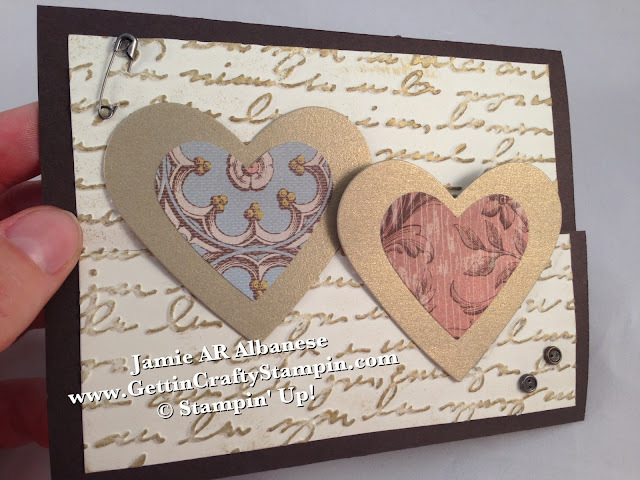 Using my Hearts Framelits, Big Shot and Magnetic Platform Punch out the Brushed Gold larger heart and the next size down in the Soho Subway Designer Series Paper. Because our paper is double sided these images vary but coordinate! Less wasted paper and double the pleasure! The Gold Encore pad and Brushed Gold card stock add elegance and shine to this refined card. 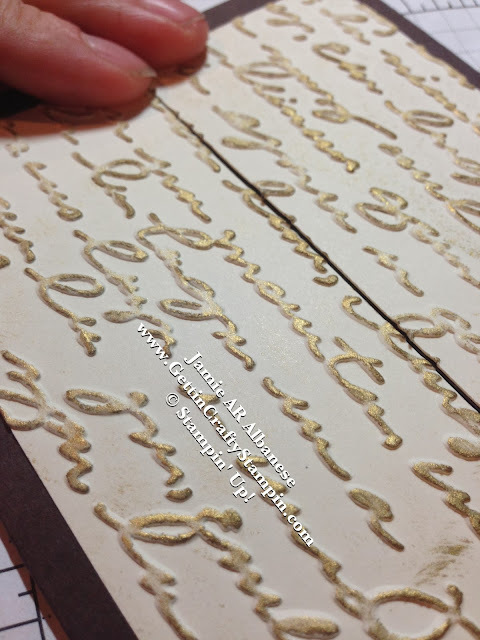 Adhering them with Hot Glue (this stands up to the embossing and the interaction of this card). One heart is adhered across the top of the heart while the bottom 'floats' and the other is the bottom adhered while the top 'floats'. This allows for them to interact. 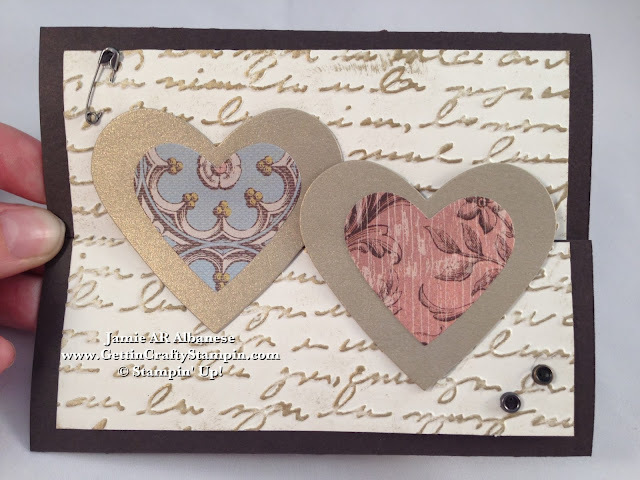 Add a little more love to this card... using the smallest of the Hearts Collection Framelits, pop out the center for these two small hearts. 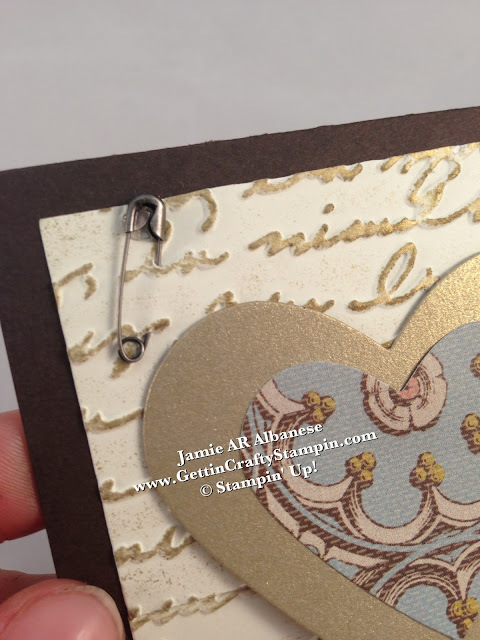 This allows me to use 'unused' parts of the Brushed Gold hearts while adding a fun accent to the inside of the card. These hearts will stay strong as they interact... delivering some love to those who receive it! They kind of wrap the card in love (or a hug). Who would YOU give this card to?? Wedding?? Anniversary?? Just Because?? Leave me a comment and let me know! I love that you came by today! Please share me (and the love) with your family and friends! I try to post tutorials and projects daily... so come by and visit often! No matter what type of love... this card is sure to warm hearts while sending hugs. Thankfully love doesn't go out of style... so send vintage wishes of love that will wow! I come from a long line of love.. my grandparents were married for 70 years... so cherish every moment - and celebrate... send a hand-stamped card!